An artist since childhood, Kathy Metts grew up in Burlington, North Carolina. As a high school student, she attended North Carolina Governor’s School for the Arts. In 1976 Kathy received a BA in Art from the University of North Carolina at Greensboro. Following graduation, Kathy devoted herself to her family. She had three sons, all of whom were outstanding high school and collegiate athletes. Bubba Metts, graduated from Duke University in 1990. Bryan Metts graduated from Appalachian State University in 2001, and the youngest Metts, Adam, is a graduate of the University of North Carolina at Chapel Hill, N.C. 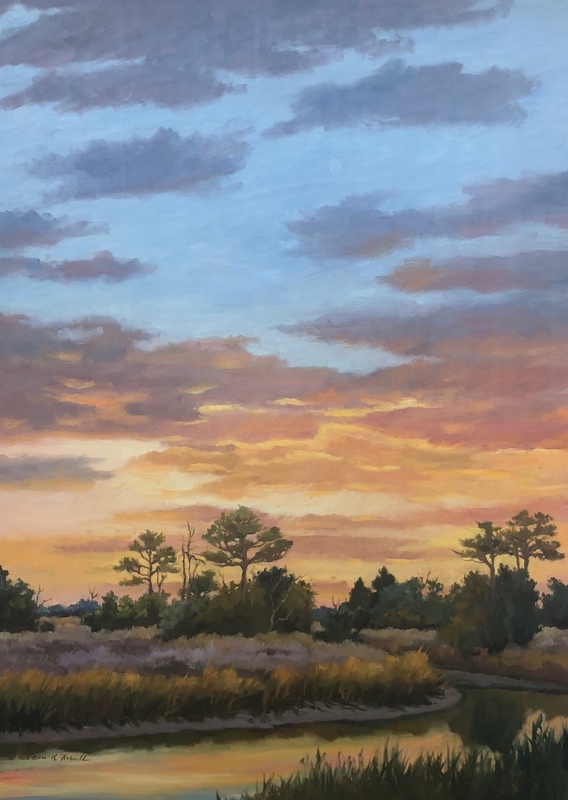 Living by the ocean and in the historically rich lowcountry of South Carolina greatly influenced Kathy’s painting style and choice of subject matter. Kathy’s charming and whimsical paintings explode with color and often depict old houses and windblown seascapes where the imaginary and familiar meet. In 1989 Hurricane Hugo devastated the coast of South Carolina including much of DeBordieu. The hurricane’s destruction of the beach and landscape had a profound impact on Kathy’s life and art. After the hurricane Kathy returned to painting with a renewed sense of purpose and energy. The years following Hurricane Hugo were a busy and productive period for both Kathy and her growing family. While working at Brookgreen Gardens, Kathy developed the Garden’s outstanding volunteer and docent education program. From 1998 until July 2001, Kathy served as Executive Director of the newly established Cultural Council of Georgetown County, a county wide organization dedicated to art and history. In 1997 with her last child off to college, Kathy moved to Historic Georgetown. Kathy passed away in 2006 at the age of fifty-nine from Cancer. In 2010, the Pawleys Island Festival of Music and Art created a scholarship in memory of Metts. The Kathryn Bryan Metts Scholarship for the Visual Arts will be awarded to a student from either Georgetown County, SC, or Alamance County, NC, beginning in 2012. 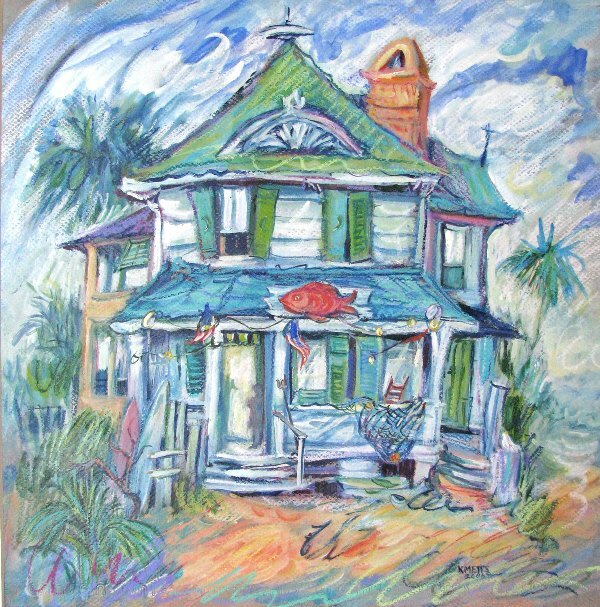 To kick off the creation of the Scholarship, the family of Kathy Metts gave permission for a very limited edition of 150 giclee prints to be made of a painting from their collection, “The Red Fish Inn”. These prints sell for $200 each, and are available for purchase at The Cheryl Newby Gallery. All monies from the donations and from the sale of the prints go to the Scholarship. Brookgreen Gardens Southern Living House 2000-2001, Murrells Inlet, S.C.
Brookgreen Gardens Southern Living Artists Outdoor Art Show 2001, Murrells Inlet, S.C.
First Place 2001 Harborwalk Juried Art Show Georgetown, S.C.